Although Seattle seems to be the current capital of the coffee world, coffee drinking appears to have first developed in Yemen during the 15th century. By 1640, the first reported coffeehouse was opened in what is known today as Istanbul, Turkey. The unique taste, aroma, body, and method of preparing devised during the days of the Ottoman Empire survives to this day and are even considered an Intangible Cultural Heritage of Turkey according to the United Nations Educational, Scientific, and Cultural Organization. The following guide will show you how you can enjoy the ancient tradition of Turkish coffee. Turkish coffee refers to a method of preparation rather than a specific type of coffee bean. It is a form of unfiltered coffee where the roasted beans are ground even finer than what you would use for espresso. The coffee is simmered in a copper pot called a cezve or ibrik and then served in small cups where the grounds are allowed to settle to the bottom. 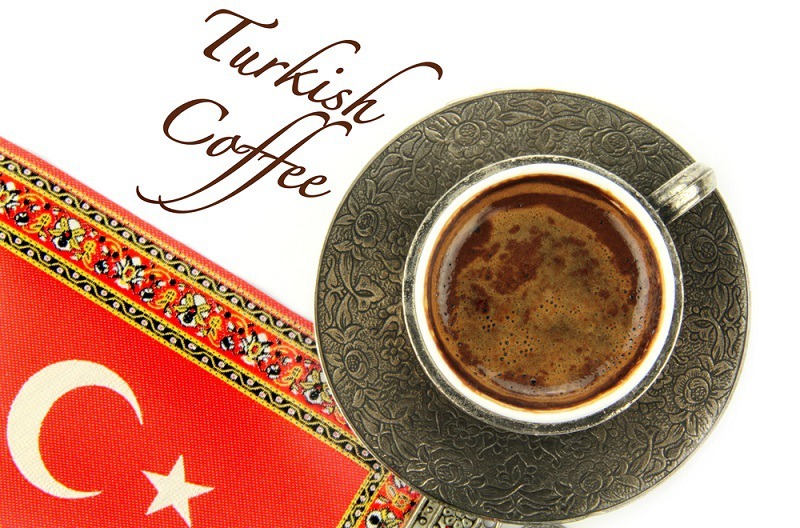 Turkish coffee can be found in the Middle East, Indonesia, Eastern Europe, the Caucasus, Northern Africa, and the Balkans. To make Turkish coffee, use 1 cup of water to 1 tablespoon of ground coffee. These ratios can be adjusted slightly to suit your personal preference. Turkish coffee is very strong, so you can adjust the level of sweetness to your taste. The sugar is added during the cooking process, not afterward as with American coffee preparation. 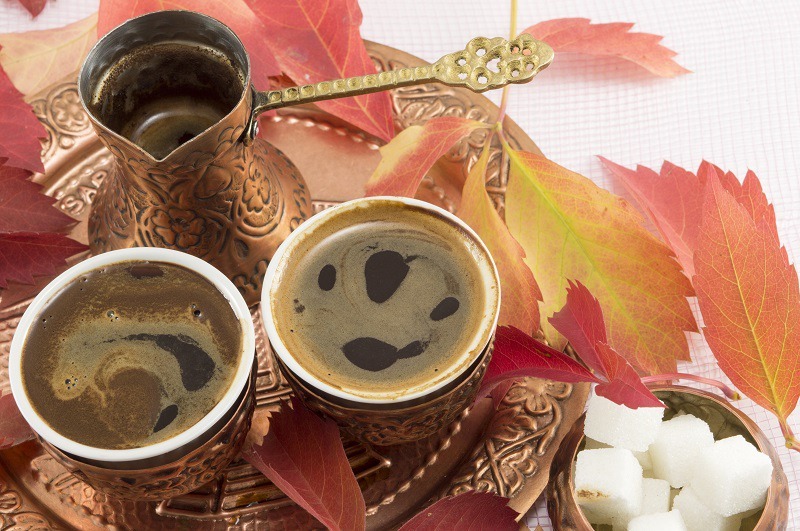 Turkish coffee comes in four variations depending on the amount of sugar added. Sade refers to coffee served without sugar. Az sekerli means the coffee is made with half of a sugar cube. Orta Turkish coffee is made with one cube of sugar. Sekerli coffee is made with two sugar cubes. You can also add extra aroma and flavor by adding a cardamom pod to the cup. Before making your Turkish coffee, you will need to gather the necessary supplies and equipment. You will need the following items. A Turkish coffee pot. If you have trouble finding one, you can use a small saucepan. Coffee that has been ground to a very fine power. Turkish coffee is traditionally made with Arabica beans, but any medium-roast bean will work. 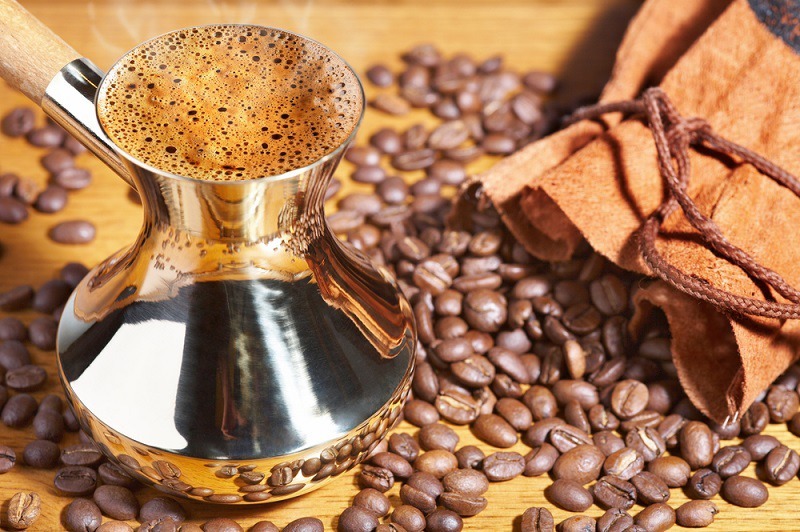 Unless you have a quality coffee grinder at home with a designated Turkish coffee setting, you may need to have your beans ground at the coffee shop or grocery store. The inexpensive electric coffee grinders that are in most kitchens will not do the job. Preparing the coffee requires patience and precision. Fill the cezve with the desired amount of water, and place it over medium-high heat. Once the water starts to get warm, add the coffee and sugar if desired. You should avoid the temptation to stir since this could cause your coffee to clump. When the coffee begins to sink to the bottom of the water, stir before reducing the heat to low until the brew starts to foam. When a ring of small bubbles forms on the surface of the brew, reduce the heat a little more to keep the mixture from boiling. The key is to keep the coffee foaming at approximately 158°F. The more froth you have, the better your coffee will taste. Despite numerous recipes to the contrary, the mixture should not be allowed to boil. If the bubbles start to rise, reduce the heat further. You can also move the coffee pot on and off the heat source to allow the bubbles to reduce back down. Once you have done this a couple of times, your coffee is ready. Once you know how to make Turkish coffee, you will need to know the proper serving technique. Turkish coffee is traditionally served in 3-ounce demitasse cups or in a Turkish coffee cup called a fincan. You want to warm the cups by keeping them filled with warm water while you are making your coffee. You should pour the coffee quickly at first to get the foam and then slowly. Each cup should have an equal amount of the foam. You should never stir after pouring the coffee into the cups since will collapse the foam. You should allow the grounds to settle for about 30 seconds before drinking the coffee. Turkish coffee is also normally served with a glass of water. It is customary to drink a sip of water before enjoying the coffee to cleanse the palate. It is important to remember that Turkish coffee is a treat that is meant to be sipped and savored, so find a comfortable place to sit back and relax. There is a common superstition that says that the grounds from a cup of Turkish coffee can be used to tell fortunes in a practice called tasseography. After drinking the coffee, the cup is turned over and allowed to cool. The pattern left by grounds is then interpreted to read the coffee drinker’s fortune.